I can understand that it pisses you off when someone works at low rates or even for free. It undermines the entire industry and changes the clients’ expectations. This problem is common in many other areas too, and I felt it myself whatever I did, be it translation, writing or photography. But you know what? I believe that the rate rises with the quality of the service. A photographer is not just a person with a camera, and all Uncle Bobs out there and their clients will realize it sooner or later. Other than a DSLR and a good will, you need photographic and editing skill and constant learning, to begin with. You need to invest in your gear, cover all the legal points, build a good relationship with your client, respect the deadlines and so on. You, as a professional, already know it. And you know that not everyone is fit for all of these tasks at once. I believe that photographers who charge little or nothing can’t harm professionals who charge more and deliver what they charge for. The clients who want to hire cheap/free photographers will look for them, and they wouldn’t hire you anyway. And that’s okay. There are many other people willing to pay more to be sure they’ll get the best possible photos and experience. On certain occasions, even the clients who aren’t willing to pay more for the shoot can end up in front of your lens. Sometimes it happens that people learn the hard way that not every person with a camera is a photographer. They will end up with the photos they aren’t satisfied with, they won’t get them on time, or the relationship with the photographer during the shoot will be uncomfortable. And not to mention some more extreme cases of bad cooperation. Either way, after learning their lesson, some clients may decide to stretch their photography budget and get the job done right. In addition to free/cheap photographers, there are tons of those who make brilliant photos, and you may share the audience with them on social networks. People admire them and love their work, and they may even have more followers than you. It can be hard on the ego, but cheer up – they aren’t a threat to your business either. Many photographers, no matter how good they are, simply don’t want to make money from their photography. They enjoy learning and taking photos, they “have a good eye” – but it remains a passion and a way of winding up after their workday is done. They have different jobs they love and make money from them, and photography is just a wonderful addition to their life. Many of these hobbyists don’t ever plan on turning pro, and they are fine with likes and shares on social networks. There are enough likes and shares for everyone – and you can keep the clients and go on making money from your own brilliant photos. Now, I am not a professional photographer; I’m only a person with a camera and passion for photography. But as I mentioned, I’ve had experience with clients in a few different areas in addition to photography. Too many people expect to get professional service for little or no money, and I know how annoying that is. But they are none of your concern, as well as the photographers who decide to work for them. You simply shouldn’t work with people who don’t appreciate your effort and results. I learned it the hard way, but the important thing is that I did learn it. So, instead of ranting over those who charge little or nothing for photography, focus on your work and never stop honing your skills. Despite everything, there are people who’ll pay a fair price for a top-notch service. They are your clients and the people you should focus on. And imagine those who work for free when they need to put up with the customers who act like they’ve paid a full price. It’s harder for them than it is for you. Finally, don’t underestimate your work, but give the best you can to your clients for the price they pay you. In the end, you’ll certainly have fantastic references, many positive experiences and of course – the money you earned with your great work. I may be too optimistic, but I believe there’s enough space for everyone to express, gain the clients they want and develop their photography business. I’m curious to hear if your view on this matter is equally optimistic, or you disagree. Leave your thoughts and experiences in the comments below. It might be true for actual professional photographers in a corporate world. But how about those who are trying to get up there? You need to pass the small local businnesses first, who are all slowly getting used to free photographers and their mediocre work. They, indeed, are no threat to professionals, but in my opinion, they do harm the ones that are trying to grow. I know what you’re saying. Frankly, I had more problems with this when it comes to translation and writing (those are my primary areas after all). It’s hard to get up there, and so may translators are doing work on shamefully low rates. But I learned that people whose only priority is to get something for free or cheap wouldn’t hire someone to do a decent job for a higher price anyway. And the worst kind are those who want it to be both good AND free/cheap – but those clients are only good for avoiding. The author clearly never took an economics class and knows nothing about supply and demand. Just great; the world of photography needs a few more fools like this. I totally understand the sentiment of pro photographers. On the other hand, many of these pro photographers started as an uncle bob or a kid with dslr and climbed up, established themselves and now feel threatened by younger versions of themselves. They were passionate about photography and turned that passion in to a job. Isn’t that a good thing? There are pro photographers who do not care about the photography at all and yet they are making a living out of it. They could be selling cars or waiting tables but they for some reason chose photography. These are actual pros, charging actual rates and churning out terrible photos devoid of any trace of emotion. Now what is better for a small sized client? Pro dude who just presses the button or a hobbist who loves what he does and does it with passion? It depends. Your lazy pro can shoot your wedding half assed and the fact that he shot dozens of weddings will not matter and passionate kid will do a great job. Or vice versa, kid will screw up and pro will save the day with amazing photos. Large clients will probably reach out to a pro, who also has the passion and photos to show for it just because of all the non photography related stuff like licensing, insurance etc that hobbyist usually don’t have down. The fact that everybody is a photographer now also says something about the industry as a whole. If customers cannot differentiate between your pro photos and photos of some kid with DSLR, what does it imply about your work? 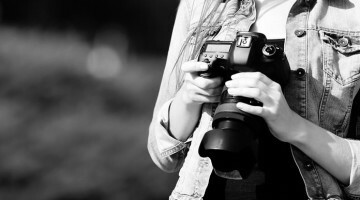 Bad photos, not amateurs working for free, hurt photography industry. A lot of photographers won’t like this article but I completely agree. If the client can’t see a difference between my work and a cheap alternative, either the client can’t tell the difference and accepts the cheap results, or I’m charging more than I should and my work is not good enough, so I’ll have to make better art.